By the middle of October it was an open secret in Petrograd that the Bolsheviks were getting ready for a coup. The denouement was finally triggered on 24 October by Kerensky, who ordered pro-government soldiers to close down Bolshevik newspapers. At this critical moment, the MRC called upon Red Guards and troops loyal to it to resist the attack and reopen the presses. The government efforts to reassert its control over the capital were successfully rebuffed. On the evening of the twenty-fourth, seizing the initiative from the Provisional Government, the Military-Revolutionary Committee, under Trotsky’s command, directed its detachments formed of workers, revolutionary soldiers and sailors of the Baltic fleet to take over the nerve centers of the capital, including the railway stations, the bridges, the central post office, the central telephone exchange, the electric power stations. There was hardly any resistance as they took control over the capital. That night Lenin himself left his hiding place wearing a disguise and traveled by tram to the MRC headquarters at the building of the former Smolny Institute, where he took charge of the insurrection. The uprising ended with the virtually bloodless storming of the Winter Palace where Kerensky and the ministers of the Provisional Government were meeting. Pro-Bolshevik units stormed it during the evening of 25 October. All the ministers of the Provisional Government were arrested except Kerensky, who had managed to escape in a car provided by the United States embassy. Shortly before the storming of the Winter Palace, a Second All-Russian Congress of Soviets of Workers’ and Soldiers’ Deputies had assembled in the capital. When news came of the overthrow of the Kerensky’s cabinet, the minority of moderate socialists at the Congress denounced Lenin’s seizure of power and walked out. 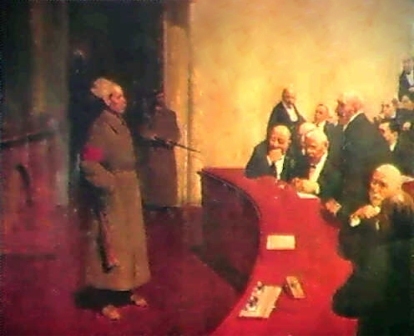 However, the majority, made up predominantly of Bolsheviks with a substantial bloc of radical, left-wing Socialist-Revolutionaries, endorsed the coup and approved the formation of a Bolshevik Government - the Council of People’s Commissars - empowered to rule Russia till the convocation of the Constituent Assembly. 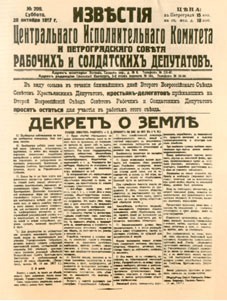 The Congress also passed first two decrees of the new Bolshevik government: the Decree on Peace which called on peoples and governments of the belligerent countries to conclude a ‘democratic peace without annexations and indemnities’, and the Decree on Land, which authorized the redistribution of the gentry land to the peasantry. The Bolshevik seizure of power had set Russian history off on new and uncharted paths. Most of the leaders of the new working-class government came from the radical intelligentsia, yet they claimed to represent the peasants and workers of the Russian Empire. The new ruling elite pledged to build an entirely new type of government, the likes of which had never existed before. Its claim was that for the first time in human history a government would serve the interests not of a privileged, exploiting minority, but of the overwhelming working-class majority of society. PREVIOUS GO TO "INTERPRETATIONS OF 1917"